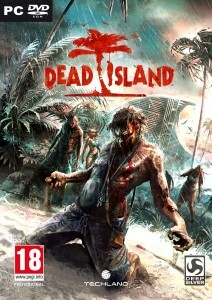 Dead Island cover. Not a very good fit with the game! Should be more campy. It’s been five years since I posted about Dead Island looking like something I might enjoy. It took them a while to get it out and despite a somewhat mixed reception, I’m enjoying it a great deal. As with many other games from eastern Europe, Techland’s game is recognizably a product of its region. There is just so much going on! There’s a strong simulationist bent, as with Stalker, and both in design and art direction, it is all over the place, going full-speed in every direction at once. Although it’s a lot to take in when you begin, all the game systems work to bring you inside the game world. I was initially worried about all the weapon experience and breaking stuff and the unclear checkpoint system where you respawn back to sometimes mysterious locations would keep me from being immersed, but it works the other way. It shouldn’t, really. You’re constantly bound by game system limitations and taking risks, weighing tangible gameplay rewards against gameplay risks. It doesn’t feel like a very natural way of looking at things, but it’s all based on the survival scenario, and somehow it just hangs together. That’s not to say it isn’t clunky. The movement and first-person fighting never feel anywhere near smooth, and it’s not pretty to look at – Dead Island is an ugly game on many levels, from the (very) unlikeable character models to the technical quality. It feels like watching a cheap horror movie – you get into it despite of, and indeed because of, all the ridiculous plotting and cheap, bad actors, lacklustre sets and limping action. In that way there’s something of the same vibe here as with Onechanbara, although Dead Island is a more serious, demanding affair.